Ringette Canada is committed to achieving important milestones and seizing new opportunities in an ever-changing environment. Ringette Canada is entering the next four years with a solid foundation built on an extensive planning process that took place in 2013 that led to the development of its current strategic plan. Ringette Canada felt that the timing was right, at the mid-way juncture of its 2022 goals, to pause, reflect and renew its strategic plan for the next four years. You can help us do this by completing the following survey https://www.surveymonkey.com/r/SMGCT7G and providing us with your input. This survey is open to all ringette stakeholders and enthusiasts who are interested in helping Ringette Canada renew its strategic plan. Please think deeply about the questions and let us know what you think, feel, and hope for Ringette Canada. We encourage you to review Ringette Canada’s current strategic plan at https://www.ringette.ca/wp-content/uploads/2015/03/Ringette-Canada-Strategic-Plan-2014-2018_Final-English.pdf as it will assist you in completing the survey. Once you have completed the survey, simply press “done”, and your survey response will be forwarded confidentially to a database. All data will be collected, sorted and analyzed and the summary report will inform the renewal of Ringette Canada’s Strategic Plan. 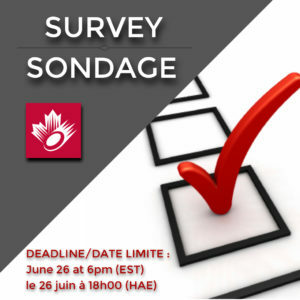 SURVEY DEADLINE: June 26, 2018 AT 18h00 (EDT). If you have any questions regarding the above, please contact the Ringette Canada Executive Director, Natasha Johnston at 613.748.5655 ext. 222 or by email at natasha@ringette.ca.